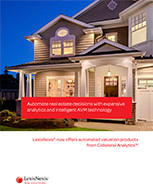 LexisNexis® is pleased to offer direct access to the full suite of Collateral Analytics™ tools. See how nationwide market coverage, carefully refined into localized real estate insights can help your business automate valuation assessments and proactively prevent risk exposure. Strengthen strategic decisions and support profitable performance at every stage of the real estate lifecycle with Collateral Analytics. Download this overview and complete this simple form to get started.